This cello is based on a Strad model which was measured from the original cello by my master violin making teacher in Bavaria. 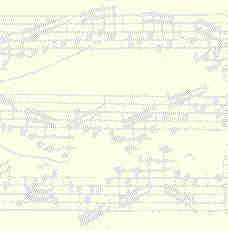 It has been very successful for soloists as well as orchestral players. The maple used for the scroll was cut in Bavaria. The highly flamed red maple used for the back and ribs comes from the northern woods of Michigan, and was cut in 1990. The spruce top was taken from trees which grew in Mittenwald, Bavaria. The linings and blocks inside the cello, holding everything together, are made from willow taken from my mother's farm in North Carolina, in the tiny village of Green Mountain. The bass bar and sound post are very old spruce taken from huge covered bridge beams (6 x 12 inches by 12 feet long). These beams were hand hewn from spruce logs drawn out by oxen in 1866 to the bridge construction site along the Connecticut river in Windsor, Vermont. The bridge was renovated 10 years ago and I managed to salvage a large supply of the spruce beams. This old spruce lends a great deal to the over all sound production of the instrument. 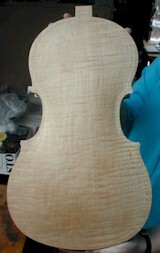 I plan to varnish the cello with spirit varnish which I made from an ancient formula inherited from my master teacher. There will be a layer of sealer (linseed oil) coated with water color for the ground coat. Then two layers of a seedlac/mastic gum combination in spirits to protect the wood. Next will be about 15 or so layers of colored violin varnish which will be applied in very thin coats, each layer polished smooth before the next layer is put on. After a few days of drying, the instrument will be set up with bridge and strings for playing. Outside arching and inside graduation of the maple back. Rib assembly attached to the wooden mold. Two views of the ribs showing the highly flamed maple. All views of the cello scroll.